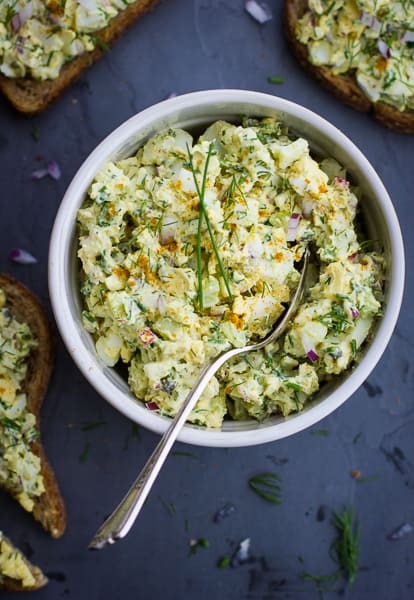 I have a soft spot in my heart for egg salad. During my barista days at Farley’s on Potrero Hill, I used to sneak up to Klein’s deli on my lunch break. 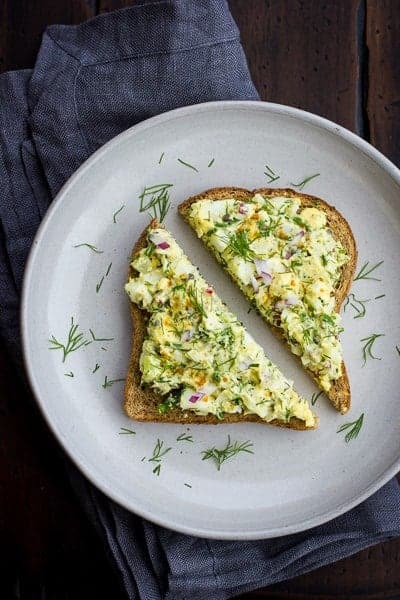 Needing respite from the sugary baked treats and sweet coffee drinks I’d snack on throughout the day, I’d order a big bowl of greens topped with a scoop of egg salad. 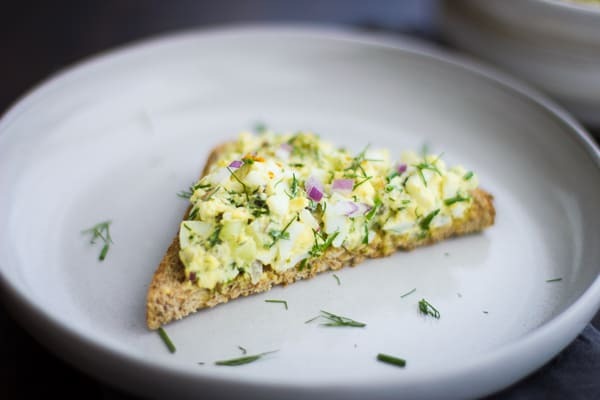 The egg salad was butter yellow and chunky, a little tangy with mustard and creamy from a judicious amount of mayo. It was just right. 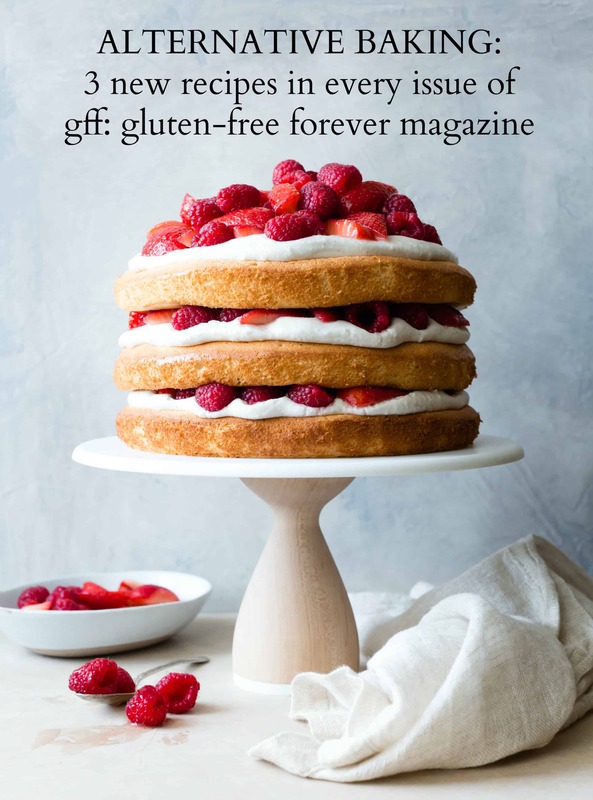 Also needing a break from people, I’d bury my nose in a food magazine borrowed from Farley’s formidable rack while I ate, trying to stretch my break as long as possible as I crunched my way through lunch. Thus, I grew to associate egg salad with peace and nourishment, as a haven from stress, sugar and PITA customers. To the outrage of the neighborhood, Klein’s closed its doors. 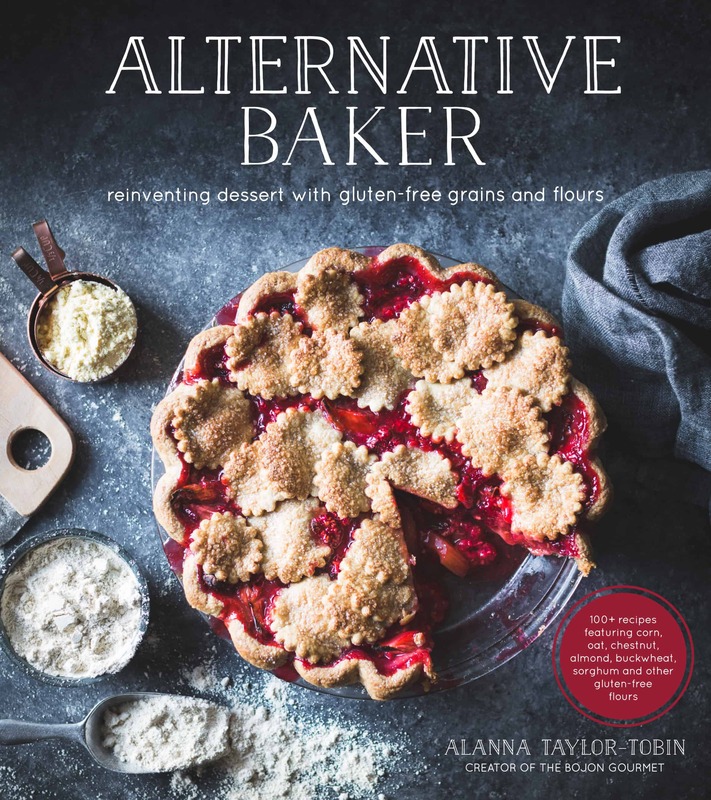 The owners renovated the space and opened an organic wine bar that was always devoid of customers, in stark contrast to Klein’s bustling clientele. The menu was devoid of egg salad. Trying to be open-minded, I went there one day on my break and ordered a green salad which seemed to be a plate of plain mixed greens with nothing on them. The place was certainly peaceful (i.e., empty) but to me it just felt depressing. I never went back. The new business closed soon after. I learned how to make my own egg salad. This is a bit of a fancied-up version, thanks to my friend Amelia whose co-op house keeps ducks. 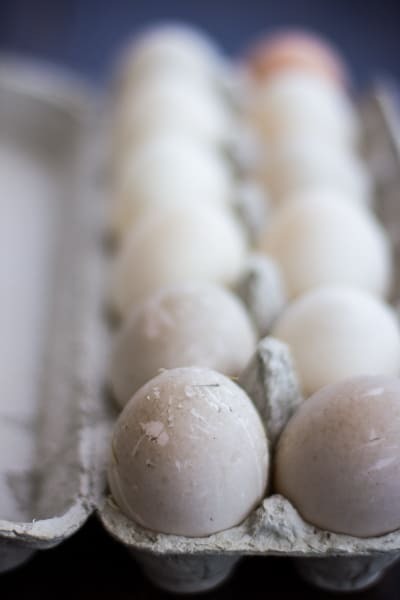 Their mottled eggs are larger than hen’s eggs, with a fat yolk that’s full of creamy richness. 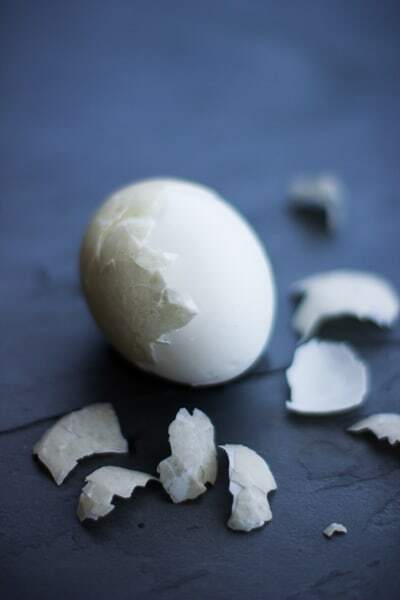 Being careful with the cooking time keeps the whites from becoming rubbery and prevents that unsightly blue ring that can form around the yolk. 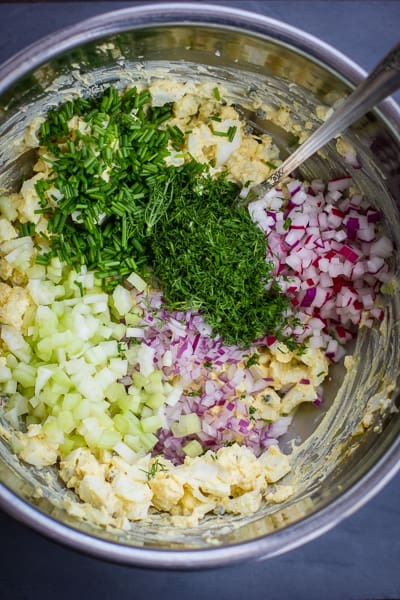 I like putting tons of herbs (chives and dill) and crunchy stuff (red onion, radish and celery) in my egg salad, and capers for some salty brine. 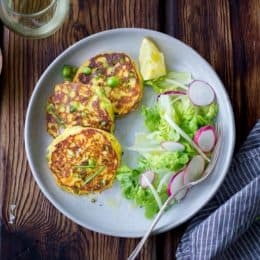 I add mustard, mayonnaise and a dash or two of tabasco, plus a spoonful of curry powder which lends a pretty golden hue and hint of spice. Smash it onto a piece of toast and you have a snack; sandwich it between two pieces, add avocado and lettuce, and you have lunch. Or you can add a scoop to a green salad. Duck eggs seem to be increasingly available; I’ve seen them at farmer’s markets and at our co-op. But you can easily make this with hen’s eggs instead – I’ve given instructions in the headnote below. 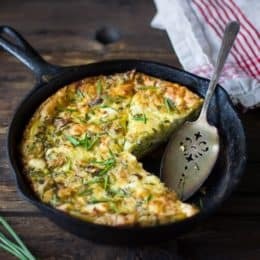 If you don’t have access to duck eggs, you can make this with 8 large hen’s eggs. If you do so, reduce the boiling time to 1 minute and the steeping time to 9 minutes. I like Spectrum’s olive oil mayonnaise, and tiny capers that have been packed in salt. Leftover dill is good in this farro cucumber salad; extra celery makes excellent Mint and Celery Soda. 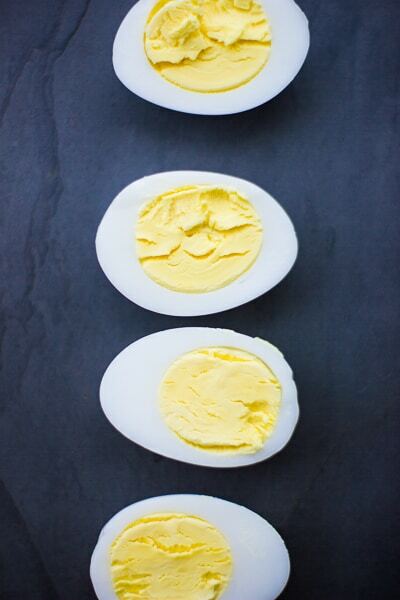 Place the chopped eggs in a large bowl. 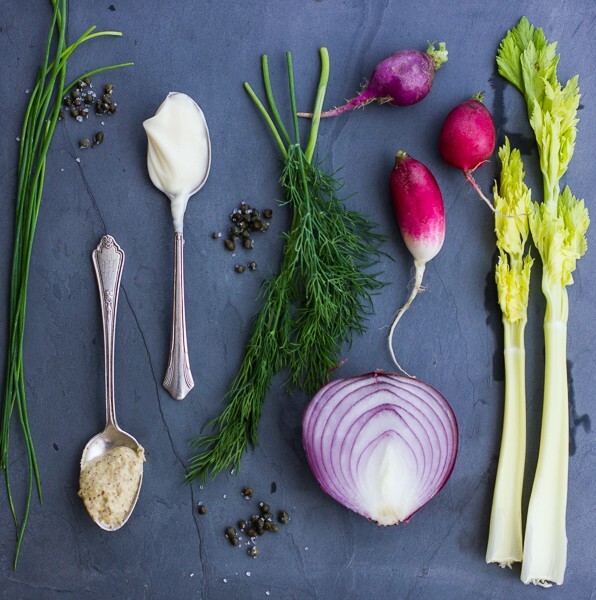 Add the mayonnaise, mustard, capers, tabasco, curry powder, red onion, radish, celery, chives, and dill. Stir to combine, mashing the eggs a bit with a large fork. Taste for seasoning, adding more salt, Tabasco, or mustard if the salad needs more pop. 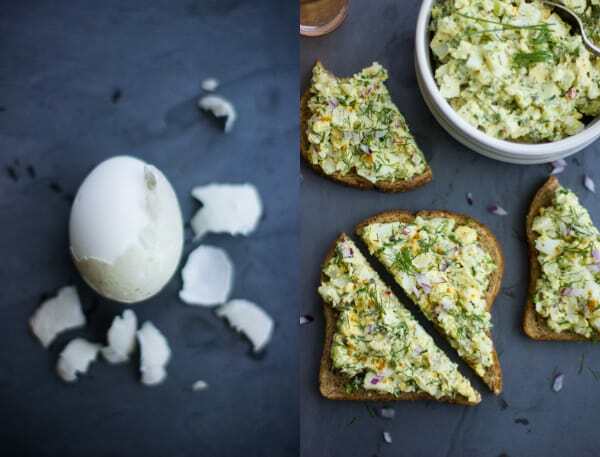 Serve the egg salad on sandwiches, or atop a green salad. It will keep, airtight in the fridge, for up to 3 days. 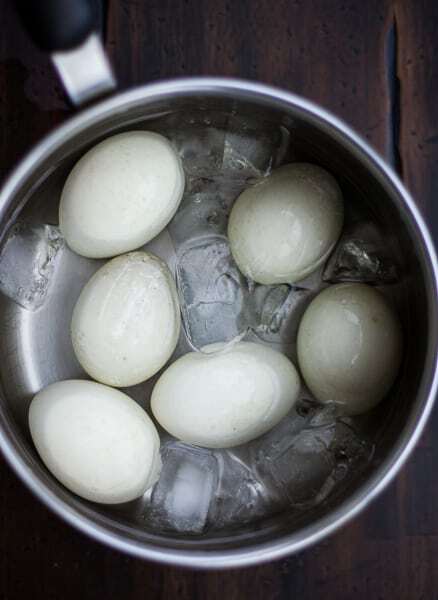 If you plunge hard boiled eggs in ice water, you don't get the green ring around the yolk. 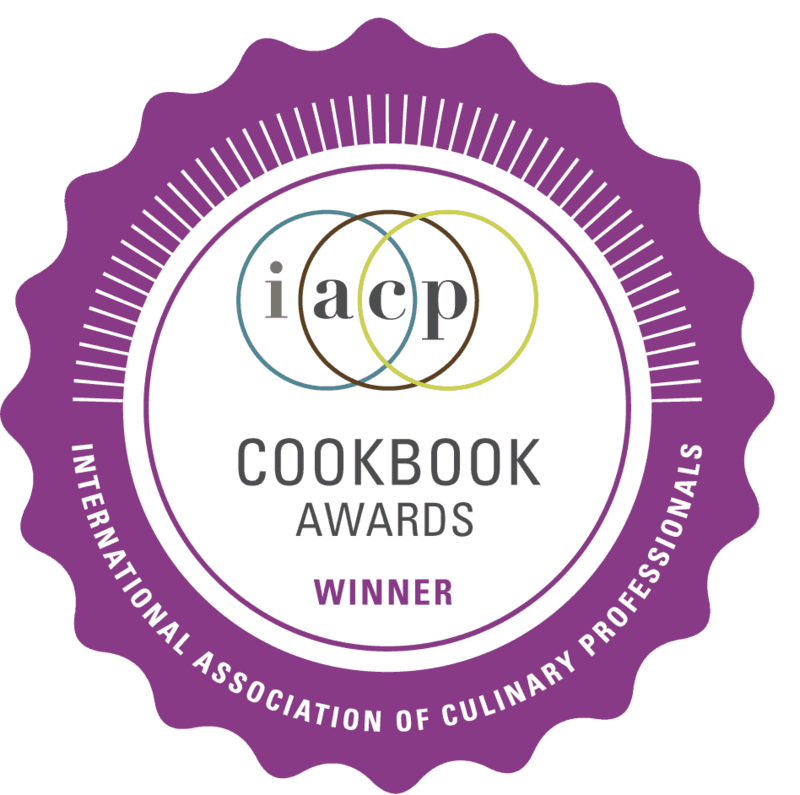 I used to teach kids cooking and that was one of the fun little experiments we'd do! 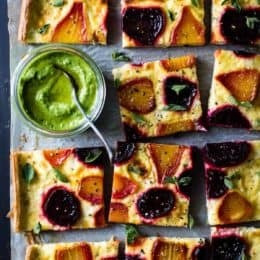 Love love this recipe! Ah, I didn't realize the ice plunging was the key. Thanks for the sweet words, Mimi! 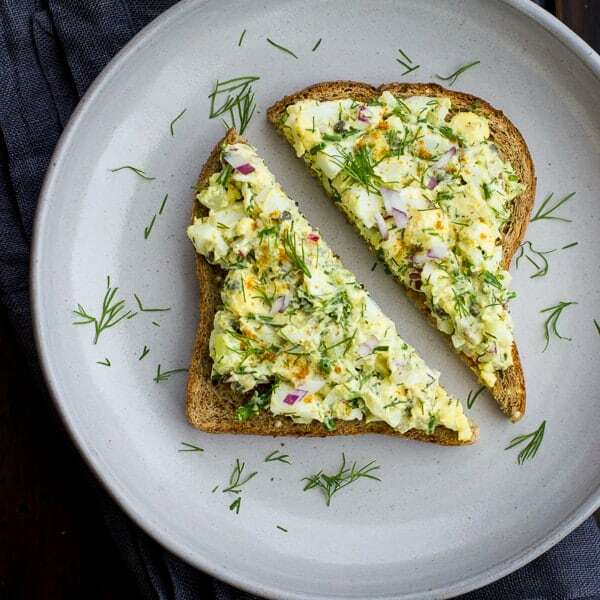 This is by far the prettiest egg salad I've seen…and I loved hearing how you came about learning how to make your own (although it was sad to hear that they had to shut their doors!) Thank you for sharing. Just delicious. Duck eggs from co-op + overabundance of dill from Aerogarden + Bojon recipe = yum! The richness from the ginormeous duck yolk balances with the crunchy, salty, spicy and the dill takes me back to sweet. 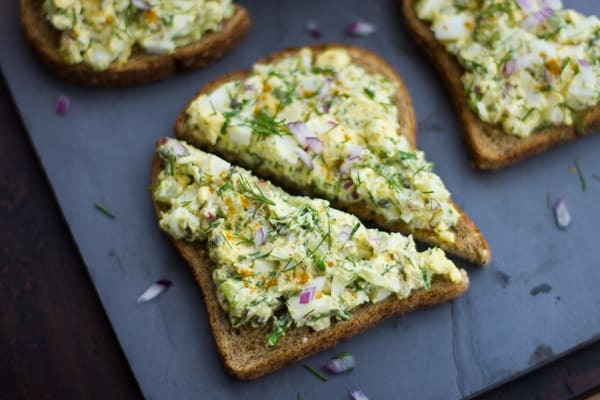 Thanks for the recipe – that is some amazing egg salad. Ate it on a Wasa cracker. This would make great appetizers, too. Maybe on a blini? With a little salmon?